Bennett: 'I'm for preserving status quo, now it is correct not to allow Jews to pray,' says Jewish construction is ongoing. 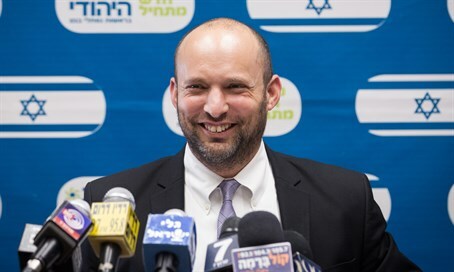 Education Minister Naftali Bennett, head of the Jewish Home party, on Monday voiced his support of the discriminatory status quo on the Temple Mount, according to which the Jordanian Waqf bans Jewish prayer despite Israeli laws stipulating freedom of worship. In an interview with Galei Yisrael radio, Bennett noted that he has chosen not to ascend the Temple Mount, which is the holiest site in Judaism. "I'm in favor of the right of every Jews to ascend the Temple Mount. I personally don't ascend the Temple Mount for a range of reasons; as a youth in the 80s I would go up there a lot," said the minister. "The Temple Mount is the national and religious center of Judaism and the state of Israel, and we must preserve our sovereignty there. But in the same breath, I'm certainly ready to accept temporary measures of the police not to allow Jewish and Arab MKs to ascend the Temple Mount." When asked why he does not ascend the Temple Mount if he views it as the national and religious center, and whether he supports giving Jews the right to pray at their holiest site, Bennett answered, "I'm for preserving the status quo, and at this point it is correct not to allow the prayer of Jews on the Temple Mount." "I'm not speaking for the rights of Jews to pray at the Temple Mount because I have national responsibility as a member of the Cabinet and I don't want to cause damage to the state and the prime minister," he said. "The Temple Mount is the most sensitive site in the world and I can cause damage to the prime minister in processes that he's advancing if I express my opinion on the issue." Bennett's support of the ban on access follows his support for installing cameras at the Mount, in a concession to Jordanian demands for greater means in banning Jewish prayer at the site. "We're building - I can't go into detail"
In the interview Monday the Jewish Home chairman then turned his attention to potential "gestures" to the Palestinian Authority (PA), meant to stem the terror wave. "I'm in favor of economically strengthening Judea and Samaria for everyone, and after all we want the Arab economy to also prosper. We have an incentive for them (the Arabs - ed.) to live well, we understand that they won't go anywhere (i.e. leave Israel - ed.) and therefore that needs to be the approach," he claimed. "But there's no connection between that and making gestures at a time of terror. They are the ones who need to make gestures and stop encouraging terror, and stop paying the murderers and celebrating their deaths." He was then confronted with the fact that under the current government, which has been termed right-wing, building plans for the PA have been approved in Area C of Judea and Samaria, which according to the 1994 Oslo Accords was to be under full Israeli control. "There's Jewish construction in Judea and Samaria, but I can't go into detail about it," claimed Bennett. "My party is doing a lot to advance Israel in the right direction, and it is present in all fields, taking care of the interests of its public at all times." Despite his statements, it was recently revealed that in the last two coalition governments, both of which Jewish Home has been part of, construction in the region has been at a record low.